Appointed Film Commissioner of The Netherlands East Indies on 28 September 1944, in September and October of the following year Joris Ivens directed Indonesia Calling (1946), a film which was anathema to Dutch colonial interests. Employed to produce propaganda endorsing Holland’s liberation of Indonesia from Japanese occupation and its post-war plans for limited Indonesian autonomy under the Dutch crown, Ivens instead created Indonesia Calling. Only 22 minutes long, the black-and-white 35mm film recreated the campaign to prevent Dutch-chartered vessels loaded with troops and military supplies from leaving Australian ports for Indonesia. (1) The short film caused a political furore, with the Dutch pressuring Australia’s Chifley Government to prosecute those involved in the making of the film. Ivens had risked arrest or deportation by directing the film. 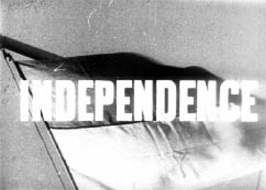 (2) What spurred a colonial film commissioner to produce such a controversial political film? Stranded in Sydney, unable and eventually unwilling to make films for the Dutch government in exile, Ivens witnessed on Sydney’s waterfront the repercussions of the Indonesian independence movement. The turmoil of World War II had left many Indonesian seamen marooned in Australian ports. With the war at an end, these seamen tried to prevent the re-colonisation of Indonesia by refusing to work on Dutch-chartered ships bound for the archipelago. Many Indonesian soldiers mutinied by walking off Dutch troopships in Sydney, demanding their freedom, and independence for Indonesia. Australian trade unions launched a campaign in support of Indonesian independence, imposing black bans on Dutch-controlled ships bound for the Indonesian islands. The ACTU and thirty trade unions led by the Waterside Workers’ Federation and the Australian Seamen’s Union enforced and supported the bans. The bans ensured that Dutch-chartered ships would not be loaded or manned, and halted temporarily the Dutch attempt to regain Indonesia by force. (14) Indonesian seamen and Australian trade unions were joined in their boycott by Australian-based Chinese, Malay and Indian seamen, who also refused to crew Dutch-controlled ships. By choosing Indonesian independence before the interests of Dutch colonialism, Ivens would be viewed as a pariah by The Netherlands and its state representatives in Australia. With the limited equipment provided by the Dutch state, Ivens and John Heyer (an Australian cameraman with the newly-created National Film Board) shot the departure of the Esperance Bay. Aboard were 1,400 Indonesians being repatriated to Surabaya, the sole Javanese port held by the Indonesian Republican forces. This footage became the opening sequence of Indonesia Calling. The Esperance Bay’s leaving of Sydney was the only time the Dutch state equipment was used by Ivens. (18) As film commissioner for The Netherlands East Indies, Joris Ivens could not be seen to be directing the film. Most of the subversive film was shot not by Ivens, but by Marion Michelle. 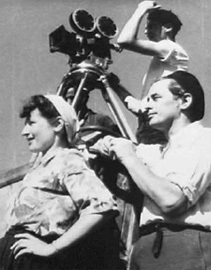 (19) Ivens and Michelle devised the scenario of the film, which depicted the shipping boycott, in their rented Elizabeth Bay flat between the 24 and 27 October 1945. The film was shot at moment’s notice without reference to a pre-meditated script. The film was literally created by Ivens and Michelle in the cutting room from Michelle’s film coverage of enacted events. (20) From this period until the film was first publicly screened, the Ivens flat was open to those who took part in or supported the making of Indonesia Calling. Apart from members of the film unit, Australian wharfies, Indonesian, Chinese, Malay, Indian and Australian seamen, dissident Dutch soldiers, and former Indonesian political prisoners gathered nightly to discuss the boycott campaign, the travails of the Indonesian independence movement and Dutch intransigence. (21) With borrowed film equipment, and only 2,400 feet of black-and-white film, donated largely by Australian servicemen returning from Borneo, Ivens told “the story of the ships that did not sail” (22). Catherine Duncan wrote more than 20 versions of the script before Ivens finally approved its narration by Duncan’s colleague, the Australian radio actor, Peter Finch, in a one-hour hired studio session. (23) The commitment of the Waterside Workers’ Federation to the cause of Indonesian independence made the various re-enactments of the film on the wharves and in the harbour possible. On 21 November 1945, after most of the footage of the illegal film had been shot, Ivens resigned from his official post. In his resignation, Ivens denounced the actions of the Dutch government in Indonesia. After his resignation, Ivens was accused of using Dutch equipment and material to make the illegal documentary. Despite lingering suspicions, an audit of the film unit’s books proved that there was not “anything wrong with the financial side of the Unit” (34). With Michelle, Ivens repaired to Blackheath in the Blue Mountains, west of Sydney, to recuperate. 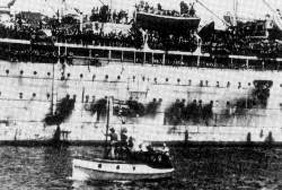 Six months elapsed before Ivens returned to Sydney to shoot the unfinished film’s climax of the Patras steamship’s return to Sydney. Indian crew members aboard the frigate had been forced at gunpoint to break the waterfront blockade. The ship, laden with ammunition, sailed out to sea before the Indian seamen stopped the engines. Their act of mutiny forced the ship’s return to Sydney harbour. Once this scene of defiant solidarity was re-enacted, all of the shooting was complete. Ivens and Michelle finished the picture editing of Indonesia Calling in one night. In Australia, Ivens had become the director of a film of which he officially could take no part – where “some actions happened at night and couldn’t be filmed; some were missed, some were created, some initiated” (40). After its screening, he could not return to The Netherlands or America. Indonesia Calling had made him an apostate. As the Cold War gathered, only Eastern Europe offered an entry point for the Dutch filmmaker. This article has been refereed. Over a four-year period, the shipping ban in Australian ports held up a total of 559 vessels, which included 36 Dutch merchant ships, passenger liners and troopships, two tankers and other oil industry craft, 450 landing barges, nine corvettes and seven submarine chasers. Three Royal Australian Navy vessels and two British troopships were also black-banned. Lord Louis Mountbatten, the Commander-in-Chief of British forces in the Far East, travelled to Sydney in January 1946 to persuade the Australian maritime unions to end their boycott on Dutch shipping. Mountbatten’s efforts failed. See Rupert Lockwood, Black Armada (Sydney: Australasian Book Society, 1975), passim. The ultimate success of the selective on Dutch shipping depended upon the Chifley Labor government’s refusal to intervene in the dispute. Australia was largely unaffected by the ban as there was virtually no trade between Australia and war-ruined Holland. Had the Federal government attempted to break the ban, Australia’s maritime trade would have been threatened by industrial action. These questions are barely considered by most accounts of the boycott campaign. See W. J. Brown, The Communist Movement and Australia: An historical outline – 1890s to 1980s (Haymarket: Australian Labour Movement Publications, 1986), pp. 164-6; Ralph Gibson, The Fight Goes On: A picture of Australia and the world in two post-war decades (Maryborough: Red Rooster Press, 1987), pp. 65-7; and Margo Beasley, Wharfies: A History of the Waterside Workers’ Federation of Australia (Rushcutter’s Bay: Halstead Press in association with the Australian National Maritime Museum, 1996), pp. 127-30. IVANS, Joris (IVENS), A6126/XMO, 18, 1945-1949, National Archives of Australia, Canberra. Rosalind Delmar, Joris Ivens: 50 Years of Film Making (London: British Film Institute, 1979); Carlos Boker, Joris Ivens, Film-maker: Facing Reality (Ann Arbor: UMI Research Press, 1978). See the magisterial study of Ivens’ life and work by Hans Schoots, Living Dangerously: A Biography of Joris Ivens (Amsterdam: Amsterdam University Press, 2000), pp. 179-93. Copies of appointment as Film Commissioner, 1944, Item 143, 2.1.143, Joris Ivens Archives, European Foundation Joris Ivens Municipal Archives, Nijmegan, The Netherlands. Schoots, p. 195. Schoots’ conclusion that “Browderism” influenced Ivens remains speculation. Nevertheless, Browderism exercised a marked influence over American and Australian communism during the Pacific War and early post-war years. See Alastair Davidson, The Communist Party of Australia: A short history (Stanford: Hoover Institution Press, 1969), pp. 157-9. Malcolm Caldwell and Ernst Utrecht, Indonesia: An Alternative History (Chippendale, Sydney: Alternative Publishing Co-operative Ltd, 1979), pp. 61-8. Caldwell and Utrecht, pp. 67-74; Anthony Reid, The Indonesian Revolution, 1945-1950 (Westport, Connecticut: Greenwood, 1974), pp. 23-47. Gerda Jensen-Hendriks, “Bersiap: Joris Ivens and the early Indonesian revolution”, European Foundation Joris Ivens newsmagazine, Issue 9, November 2003, p. 21. Rupert Lockwood, “The Indonesian Exiles in Australia, 1942-1947”, Indonesia, 10 October 1970, p. 37. Ibid, pp. 197-8. Extensive security ‘information’ on Duncan and the Indonesian members of the Unit is found in “East Indies – Film, Indonesia Calling”, A1838, 401/3/9/1/4, National Archives of Australia, Canberra. See also Catherine Duncan’s security file: Duncan, Catherine, A6126, 17, 1937-1949, National Archives of Australia, Canberra. Catherine Duncan, “In Relationship with Paul Strand and Joris Ivens; The legacy today”, European Foundation Joris Ivens newsmagazine, Issue 9, November 2003, p. 19. Oral History Record No. 226112, Allison, Edmund, National Film and Sound Archive Office, Woolloomooloo; Schoots, p. 200. Oral History Record No. 226112. Lockwood, Black Armada, pp. 225-8. Graham Cutts, “Indonesia Calling and Joris Ivens”, in Albert Moran and Tom O’Regan (Eds), An Australian Film Reader (Sydney: Currency Press, 1985), p. 354. Cutts, “Indonesia Calling and Joris Ivens”, p. 356. “East Indies – Film, Indonesia Calling”, A1838, 401/3/9/1/4, National Archives of Australia, Canberra; Cutts, p. 356. Oral History Record No. 226112. See also Allison’s security file: ALLISON, EDMUND CHARLES, B883, NX21097 (1939-1948), National Archives of Australia, Canberra. Encouraged by Ivens, Allison directed the film, Coaldust, for the New South Wales South Coast Miners’ Federation in 1946. The mines on the South Coast had the worst record for miners with ‘dusted lungs’ of any region in Australia. 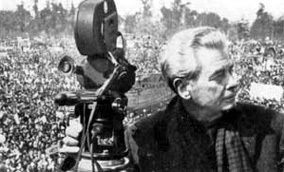 Later he shot a film on May Day for the Sydney May Day Committee. It was followed by Words For Freedom made with Cecil Holmes. This film traced the history of the working-class press in Australia. See Bob Gowland’s obituary to Eddie Allison in The Guardian, No. 1223, 13 April 2005. Arthur Gar Lock Chang, interview with Drew Cottle, Haymarket, Sydney, 11 November 2003. Arthur Gar Lock Chang, a welfare officer of the Chinese Seamen’s Union and a member of the Chinese Youth League, also helped striking Indonesian seamen find food and accommodation within Sydney’s Chinese community. Oral History Record No. 226112. Copies of resignation as Film Commissioner and related papers, 1946, Item 147, 2.1.147, Joris Ivens Archives, European Foundation Joris Ivens, Municipal Archives, Nijmegan, The Netherlands. Cutts, p. 351. See also the security file: “Netherlands: protest at film, ‘Indonesia Calling’”, A1067, IC 16, 46/49/7 (1946), National Archives of Australia, Canberra. In answering questions about Indonesia Calling, the Prime Minister had to assure parliament that the Australian National Film Board (ANFB) had not been involved in the making of the film. A number of those who helped Ivens had joined the ANFB. Catherine Duncan was among them. It was suspected that a member of the ANFB was reporting to the security service on the political activities of other ANFB staff. See Albert Moran, Projecting Australia: Government Film since 1945 (Sydney: Currency Press, 1991), pp. 34 -5. Tribune, 13 August 1946, p. 3. Ted Roach, interview with Drew Cottle, East Hills, New South Wales, 2 June 1989. East Indies – Film Indonesia Calling, A1838, 401/3/9/1/4, National Archives of Australia, Canberra. IVANS, Joris (IVENS) AG126, 18, National Archives of Australia, Canberra. Drew Cottle is a senior lecturer in Politics at the University of Western Sydney. He has an abiding interest in the worldwide struggle of workers and liberation movements. His most recent book is The Brisbane Line: A Reappraisal. Angela Keys is a PhD candidate with the Centre for Rural Social Research at Charles Sturt University. She has co-authored an article on the monopolisation of the Australian funeral industry for the Journal of Australian Political Economy and co-wrote an article on the Western Suburbs rugby league team for the journal, Sporting Traditions. Her most recent publication was a co-authored paper which examined the 1990 tramways strike in Melbourne, published in the refereed proceedings of the 2005 National Labour History Conference.